Frederick Augusta Barnard had only a limited association with Twickenham: he bought the house known as Cross Deep in 1805, probably for the future use of his son, George (1777-1817). However, neither he nor George appear to have lived there: the house was let in 1810. Barnard appears to have lived in London, perhaps for most of his working life in a Grace and Favour apartment in St James's Palace and he died there on 27 January 1830 at the advanced age of 87. His death was the subject of only a brief notice in the Gentleman's Magazine in July that year. This was, perhaps, surprising for a man of some eminence at Court. He is renowned for his work as the King's Librarian, assembling the famous collection for George III, presented to the British Museum by George IV in 1823 and now moved to the British Library. He worked at this project from 1768, then as the Royal Librarian from 1774 until his resignation in 1828 when, rather late in the day, he was knighted. During the course of his work he was elected a Fellow of the Society of Antiquaries in 1789 and of the Royal Society in 1790. He married Catherine Byde. She was the daughter of John Byde who had been Page of Honour in the household of Queen Caroline, the consort of George II. She survived Frederick, dying in 1837. Barnard's father, John (d1773) had been Gentleman Usher Quarterly Waiter and Page of the Backstairs to Frederick, Prince of Wales and the Princess Augusta of Saxe-Gotha between 1738 and 1751 when the Prince died. 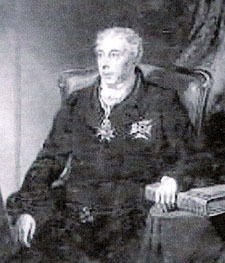 It is evident that the family maintained a close connection with the Court: Frederick was named after his father's patrons the Prince of Wales and his wife the Princess Augusta. His own first appointment to royal service was as Page of the Backstairs to George III, following this monarch's accession in 1760. Barnard's working life is well documented elsewhere. What have not yet been revealed are aspects of his personal life. And death. His will, made on 2 July 1827 states him to have been “of the Stable Yard, Saint James's” and records his ownership of the Twickenham house (together with a pew in St Mary's Church), then leased to Mrs Butler. His wife is named as his principal legatee, with provision for his grandson to inherit in due course, together with other specific legacies and annuities to various individuals. He provided for the payment of his funeral expenses but did not specify where this was to take place. There was a son, and perhaps a daughter of the marriage, but George, born in 1777 died in 1817 leaving a grandson, also George, who died in 1846. Following protracted research it has been discovered that Frederick's funeral took place at the church of St Martin-in-the-Fields facing what later became Trafalgar Square, on 3 February. His body was probably taken to that church's burial ground, St Martin's Gardens, the Boneyard, Pratt Street, Camden.